Morgellon’s Disease &Possible Cures* Plus: How is Morgellon’s Disease Spread? Notes: Similar intent is shown in Title 50, 1250a. The use of the words PUBLIC LAW is deceiving to say the least. That 105-85 is from Statutes at Large wherein the title of the volumes are PUBLIC LAW Volume ___. This is actually a Private Act and/or Acts of Commerce. The actual Public Law says simply to do no harm! PROOF_ PUBLIC LAW 105-85, Bio Warfare & Population Reduction funded by the Dept. of Defense against ALL US Citizens. US Government considers all citizens as LAB RATS !! LINKS BELOW !! THEY HAVE BEEN SPRAYING SINCE 1997 WITH INCREASED INTENSITY IN THE LAST SEVERAL YEARS..
Borgellons - Wired to the Matrix Now omg!!! ClimateViewer Reports - Taking YOU from Armchair to Activist! Make your voice heard! Info: "As the natural world dies around us, what will take its place? Planetary engineering includes bioremediation measures to bring us genetically engineered trees and crops. And what of humans themselves? How are we being transformed from the inside out? Presented at Conspiracy Con 2011, this 1 hour power point presentation by Sofia Smallstorm introduces primary and scientific findings hidden in the muffles of mainstream alternative media." (PotentNews.com) As many of us now know, a vast amount of airplanes are currently spraying most of the Earth's population with aluminum, barium, strontium, etc. Less discussed components of the spray programs include lab-created synthetic life-forms and other biological materials such as red blood cells, fungus, and self-replicating nano-fibers. Massive and diverse geo-engineering operations are indeed occurring. Moreover, a peculiar syndrome called Morgellons has emerged and has now been linked to these eugenics/transhumanist operations. While this is alarming, humanity should at some point face the ugly details of this dilemma. This is an agenda partly involving a nano-technology infestation in our bodies. Potent News Blast #10 seeks to shed some light on this often neglected issue. I created this video in 2007 immediately after hearing the Jeff Rense radio interview as many of us had long been after some sort of evidence linking the fallout recorded from high level aerosol spraying and the nasty, post-modern, hyper virus that is Morgellons dis-ease. I have pointed out in written articles online that no TRUE evidence exists for chemtrails and morgellons. I think the confusion lies in the nano-tube type base which have been seen in both chemtrail fallout and morg's samples BUT this is not a link. I maintained this stance from the start. 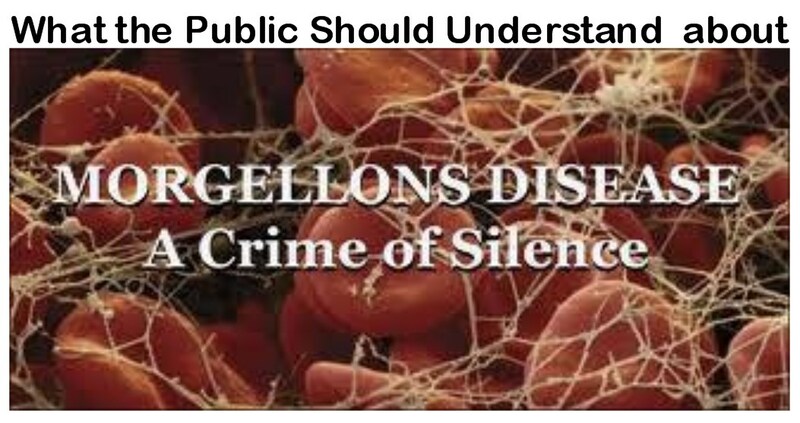 Hello my friends, in preparation for the upcoming London Chemtrails Awareness Conference I have been researching some of the Carnicom Institute findings on Morgellons a condition linked to chemtrails. The test involves swilling and holding some red wine in your mouth for approx 30 secs or until you feel the tingling sensation in your mouth. Spit out the wine into a white bowl for examination.... Please be brave enough to try this for yourselves and you will be amazed.... Tiny hair like fibres in large quantities appear.. I have left them in the dish, whilst writing this and I will post the picture... They have settled in a pattern! Such is Ben Franklin’s saying. How true it is! He was talking about fire prevention, but the analogy can surely be applied to health. Especially when it comes to heavy metal and chemical exposure, the body’s immune, nervous and endocrine systems may likely be worn down faster than therapies can build them back up, though there is some individual variation (see quote at the conclusion of this article). That said, there is also a lot we can do to protect ourselves from the exposure in the first place, and to rejuvenate the body once the exposure has taken place. It just takes time, that’s all, and a physician’s supervision if a health injury has actually occurred. But let’s not go there. Instead, the focus of this article is how you can take extra precautions to shield yourself from heavy metal poisoning from chemtrails, assuming that you are a healthy individual. Because people on the Surviving the Middle Class Crash and Speak Truth 2 Power sites have expressed concern, I thought I would offer a thought or two about this. Let’s first take a look at the contents of chemtrail sprays. Then we will know what we are up against, and how to proceed further with strengthening the body’s defenses (which is absolutely never a guarantee that no health injury can occur, especially where chemtrail exposure is concerned. Only a precautionary measure). Literature available about chemtrails may be controversial and conflicting, but that of course may be reason in itself to raise some querying eyebrows. 12. Other Bacilli and other toxic molds capable of producing heart disease and meningitis as well as acute upper respiratory and gastrointestinal distress. 13. Carcinogen Zinc Cadmium Sulfide. Yikes! Well that’s a lot to bite off and chew, isn’t it. So before we go into the discussion of dietary and herbal support for such exposure, let’s look at ways to reduce exposure in the first place. a) It’s the age-old trick of people who are environmentally ill. They wear a scarf or mask over their nose and mouth, to filter any chemicals out of the air they breathe. If you see chemtrails in the sky, you and all of your loved ones should be doing the same. d) One blogger mentioned covering her garden with thin plastic on spray days. The thinnest grade of plastic, she points out, allows the plants not to suffocate or overheat, but still protects them. Remove it after spraying is done. Wear gloves and wash them, and your hands, thoroughly. e) In his article titled “Living Safely in a Polluted World: Your Home Should be a Haven”, Dr. Leon Chaitow suggests taking off your shoes prior to entering your home. This is not merely for housekeeping purposes, but for chemical hygiene: Heavy metals such as lead may be contaminating the soil from prior exhaust fume exposure, he writes (it lasts many years prior to breakdown), and clings to dust particles. Other chemicals also cling to dust, he writes. With chemtrail sprays, the same cautions may be observed. Extra vacuuming and dusting will be key. f) Vacuum your furniture, rugs, drapes (yes, drapes especially, don’t forget how much they may filter out from incoming air) and home very well if there is any aerial spraying going on. Close your windows and doors on spray days. Immediately throw out any vacuum bags after use. g) Essential oils in your home not only smell pleasant, but have anti-microbial action. Tea tree and oregano oils are particularly effective against viruses and bacteria, with citrus oils following second in line. Lavender will kill some dust mites too, but has less anti-viral/anti-bacterial action than the oregano and tea tree oils. It is perfectly okay to mix the above oils together. Very lightly spray them on your drapes, carpets, floors and put them in your heat vents. Consider very lightly spraying them in your car, too, particularly on floor mats and seats (essential oils are exceptionally powerful, so don’t overdo them. Two drops in a mugful of tea water, or about 4 to 6 drops in a sprayer bottle of water, are all that you need. Just enough to smell nice, without being overpowering. Don’t use if you have infants, they may be too strong). h) Spread word, spread word, spread word! www.pesticideinfo.org › Least/Non-Toxic Alternatives (on the Home page, see Chemicals or Alphabetized Chemical List). Now, how do we support the body’s defenses against such an onslaught as a mix of heavy metals plus various mixed, noxious microbes, alongside carcinogens? There is no simple answer. But fortunately, the herbal world does have a lot to offer for detoxifying the body, strengthening the liver and kidneys, plus very effective anti-viral herbs that are for the most part free of side-effects. With no guarantees made to any reader (I never make guarantees, and it all depends so much on individual vulnerabilities), a panel of physicians at a lecture I attended, said that the drug Tamiflu will shorten your flu duration by 12 hours, whereas elderberry will shorten it by 48 hours! (There were naturopathic doctors and a mainstream doctor on the panel, who agreed with the naturopaths). May I strongly suggest that readers purchase their own copy of naturopathic doctor Linda Rector Page’s book called “Healthy Healing”. This book offers excellent home remedies for many ailments from A-Z, with each ailment in a one-page quick-glance format. Herbs, homeopathics, diet, and body work are each listed in columns for each page. Additionally, her book discusses various detoxification methods and the information is quite handy. World-ranking herbal authority Christopher Hobbs has several books of interest too. His “Foundations of Health” is a very lay-friendly read, with many detoxification regimens offered. “Natural Therapy for your Liver” is in lay-friendly language and goes into scientific depth, using technical terms yet still an easy read. This book offers detox herbal formulas, but also discusses many of the herbs in depth, plus some of their specific impacts on the liver and its enzymes. So it’s the more technical book, for those who are interested in that information. You can also log on to www.healthy.net where only nationally and world-renowned physicians, naturopaths, homeopaths, acupuncturists and herbalists post their articles. You can look up almost any ailment by entering it into the search box. World-ranking herbal authority David Hoffmann has his herbal material medica on this site, so you can look up individual herbs with his in-depth world of wisdom offered for anybody who is interested. Dr. Joseph Mercola has written many articles about chemical and heavy metal poisoning, and to google his articles would be time well spent. Having myself fully recovered from environmental illness more than 26 years ago, and as herbalist with training in this area, let me hereby offer a few thoughts for adjunct support, subject to your physician’s approval. 4) Strengthen your immune system, which should not tolerate long-term infections or illnesses unless it has been broken down to begin with. (The onslaught of mixed heavy metals with noxious microbes is very likely enough to break it down). 5) If actually poisoned by chemtrail sprays, ask your doctor to test and balance your hormones as necessary. NOTE: If your thyroid is low, you will possibly be prone to increased risk of infections, colds and flus. If your adrenals are low, you will be more prone to stress and inflammations, with lowered immunity in general. You could also be at increased hormone-driven cancer risk if DHEA levels are low. 6) Eat as many organic or pesticide-free, hormone-free, antibiotic-free and GMO-free products as you possibly can afford. (Trader Joes and the farmer’s markets offer less-expensive choices). If there is chemtrail spraying in your area, your liver is bound to be overwhelmed by the task of detoxifying the heavy metals, plus the toxins secreted by the various microbes. To give your liver and kidneys a break from any undue burden, is to free them up for the enormous task at hand, to detoxify this noxious mix of products. Use non-toxic household cleansers wherever possible, and do everything you can to reduce the load of chemicals coming in to your body. 7) Ask your doctor if you have any known health concerns, to be sure that there is no contra-indication before proceeding with an heavy metal detoxification, but also with detoxification of any kind. Make sure to ask about drug/herb/nutrient interactions, you would be surprised at how often these can occur. Make sure your doctor approves the protocol here, as well as the herbs and supplements. 8) I do *not* recommend heavy metal detoxification where digestive mucosa has been compromised, as in Leaky Gut Syndrome, Candida albicans infections or untreated Celiac disease. Instead, I strongly recommend rebuilding the gut lining first, prior to proceeding. If you have any known medical condition, or any liver or kidney issues, talk with your doctor prior to doing any heavy metal detoxification program. Vitamin C is helpful in buffering heavy metals, plus it raises glutathione levels in the liver, according to Linda Rector Page ND. To accompany this with apple pectin in capsule form would be helpful too, since this binds with and removes heavy metals that are in the gut (but does not pull it out of the cells, per se. It’s very important to remove the metals from the digestive tract, terribly important in fact to prevent reuptake and protect immune integrity). Cilantro is a helpful aid in metal detoxifying, as are sea greens of almost any kind. Take these supplements, eat a lot of apples, garlic, cilantro, onions, sea vegetables and miso, and you will be assisting your body’s heavy metals screening process. Make sure you are having at least two bowel movements daily. According to Dr. Mark Hyman, heavy metals are contained in stool material, and can be reabsorbed if the stool matter hangs around for too long prior to elimination. Do occasional enemas to clear the colon of impacted waste that causes heavy metal reuptake, plus putrefaction and toxicity-related diseases as stagnant bowel wastes escape into the blood, writes Dr. Linda Rector Page. (Note: Your body can become dependent on enemas, so only do this on occasion and not at regular intervals). But the above is for dietary “beefing up” so to speak, not for actual heavy metal detoxification. For the latter, I recommend only one product: Metalloclear by Metagenics (available at Vitacost for a substantial discount: www.vitacost.com ). This has a gentle action which boosts your liver’s own glutathione, a sulfur-like detoxifying fluid, that helps to break down heavy metals (among other things). In this way, by acting gently yet working with the liver, this product reduces the chances of heavy metals injuring your system anew as they are chelated out of the body. (Note that any product which cleanses heavy metals too quickly, can be a source of health injury instead of healthy detoxication. There is never a guarantee by the way, but this product also is a lot safer than many that I know of, at least in my opinion. Because going slowly is key with metal detoxifying, I absolutely do not recommend taking this product alongside any of the other metal-buffering supplements or herbs mentioned anywhere in this article. Use this product separately). Dr Page warns: Never fast or drink solely liquids when doing heavy metal detoxification. You need the fiber to absorb some of the toxins and metals in order to protect your body. Eat lots of brown rice and vegetables to assist detoxifying, especially of heavy metals. Some of this should be raw vegetable material, such as salad. Liquids can be used to flush out waste, but food and fiber are musts when cleansing metals. Be sure to ask for your physician’s supervision when attempting any heavy metal cleanse, to make sure all is going safely and smoothly. Vitamin D3 was said by a panel of six physicians at a lecture I attended, to “act like a firewall” against the immune system. It calms down the over-active immune system while activating the tired one, they said. This can be useful against many types of bacteria and viruses. Use only the D3 cholecalciferol version (not D2 ergocalciferol). Biotics Research makes an excipient-free, hypoallergenic product in a natural sesame oil and acacia base, called Bio-D-Mulsion Forte: www.amazon.com/Biotics…Bio-D-Mulsion-Forte…/B000UQOCCQ (do not exceed recommended dose without your doctor’s supervision. Vitamin D can help to strengthen bones and teeth, but excessively high doses can swing too far and calcify the kidneys, according to the physician panelists in the lecture I attended. It’s beneficial in smaller amounts but not in larger portions. Balance is everything with supplements and herbs. According to Earl Mindells Vitamin Bible of the 21st Century, 20,000 iu or more are considered toxic, but it’s almost never administered in such high doses. Ask your doctor for the best dosage suited to your own case). See a naturopathic or integrative physician. The following information is only for educational purposes, based on which you can ask questions of your physician. (Caution: Echinacea is contra-indicated in auto-immune disease such as, but not limited to lupus, some forms of arthritis, and multiple sclerosis. The same holds true for astragalus and some forms of auto-immunity: Avoid). Echinacea plus goldenseal as extract (much stronger than the dried herb). Echinacea is an excellent lymphatic cleanser, and goldenseal soothes the mucosal linings. Both have antiviral and antibacterial action, especially together. Use most Echinacea products for ten days, then take a one-week break prior to proceeding again (Exception: Those with low levels of Echinacea, as background herb. Auto-immune patients must avoid Echinacea altogether, regardless of dosage). If you cannot take Echinacea, try pairing up the Bio D-Mulsion Forte together with Elderberry Extract (Gaia and Herb Pharm are excellent brands). Take the elderberry in moderate doses for the moderate-term, but not long-term. Use vitamin D ongoing, with your doctor’s approval and according to his/her dosage recommendations. Chamomile tea steam: To keep the lungs clear and offer anti-inflammatory action is a small piece of the protective strategy, because the mucosal linings of the lungs are a part of the immune mucosal barrier. Prepare a pot of chamomile tea. Remove from the stove, place on a trivet on a table top. Sit down, and drape a towel over your head and the pot, to form a tent which catches the steam. Inhale the tolerably warm steam, preferably through your nose, to your comfort level (five to ten minutes). Chamomile contains anti-inflammatory bisabolol, and is just mildly anti-microbial, helps to clear the lungs and is a gentle tonic. This is a good adjunct therapy for lung infections, but also for aiding in clearing your lungs. (It may not be able to remove all of the chemicals and metals from your lungs coming from chemtrails, but can assist). Caution: Use tolerably warm steam but not hot enough to burn your face, or it can burn your nasal passages, bronchial airways and lungs too. Rinse off with cold water and pat your skin dry, do not rub with the towel because your pores will be open and sensitive after steaming. Gaia Herbs’s Respiratory Defense (most important keystone, excellent) plus chamomile tea steam, above. Mullein tea mixed with marshmallow root and fenugreek can help to reduce excess mucus. Drink the prepared tea. Very soothing to digestive mucosal linings too. Ginger compress: Grate fresh ginger root and add hot water. Put on a cloth, place on the chest with ginger directly in contact with the skin. Leave on for no more than fifteen minutes to loosen phlegm. Wipe the skin with olive oil after removing the compress. CAUTION: Do not leave a person with a ginger compress unattended. The skin can burn if left on for too long, and if the person falls asleep, the skin can actually blister. Let the skin turn a healthy pink, but not an unhealthy red. Gaia Herbs’s Breathe Naturally or Herb Pharm’s Calm Breath. See also Amla Fruit, below for adjunct support alongside the herbs. Mullein, fennel, marshmallow root tea plus added peppermint leaf to soothe irritated digestive lining. Chamomile and mint tea, together for stomach flu or aches. Honey has mild antimicrobial action and can help to counteract nausea (avoid with diabetes or hypoglycemia). Ginger and lavender help nausea, mix with mint for pleasing flavor and to break up digestive gas. If you have Leaky Gut Syndrome, consider the use of L-Glutamine and Gamma Oryzanol (from rice bran oil) to rebuild the gut lining. Use the marshmallow root tea above to soothe the inflamed digestive mucosa. Digestive PH is important to breaking down unfriendly bacteria and viruses: If your PH is too low, use apple cider vinegar daily (a couple of teaspoons or tablespoons in a glass of water, to tolerance. Think also of salad dressing). Lemon is in itself acidic, but actually alkalizes the system once ingested. Unfriendly bacteria and viruses require an alkaline environment for their survival, and most will not survive the stomach acids if strong enough. Keeping your PH balanced is an important part of your defense. Ginkgo, hawthorn and horse chestnut also benefit capillary strength and elasticity. For nose bleeds, use these as backups to the quercitin or amla. Dr. Rector-Page writes that “Lipoic Acid is a potent promoter of glutathione, and an important co-factor in energy metabolism, especially during stress conditions. It also increases the effectiveness of other antioxidants, like vitamins C and E. Lipoic acid is one of the most potent liver detoxifiers ever discovered”. Milk thistle would usually be associated with chemical detoxifying more than with heavy metals, but would also be extremely useful as extra support in this situation. It helps the liver to build new liver tissue, and its constituents are believed to bind with receptor sites to block chemical uptake, thereby protecting the body from toxicity. A liver protectant, also has some adrenal gland supporting functions. Caution: Do not mix milk thistle with chemotherapy or radiation therapy, the herb potentiates the uptake of both regimens and can put you at risk of drug toxicity. In fact, do not mix any of the instructions here with any cancer therapy. See your doctor. This is very important, for your own well-being. Schizandra is a Chinese herb which has liver protectant functions, supports the adrenal glands (involved in anti-inflammatory responses) and the immune system, each alike. Burdock, artichoke and dandelion root are helpful adjuncts alongside milk thistle or schizandra for liver support and detoxification. Bupleurum is a Chinese herb that regulates energy flow through the liver, stabilizing liver function and aiding cleansing. Helpful with mood swings. It’s okay and even optimal to mix the above herbs as a liver-supportive formula. Many commercially-prepared herbal formulas contain a mix of several herbs above. I like GAIA Herb’s Milk Thistle Yellow Dock. Essential fatty acids (EFA’s) strengthen the walls of fatty tissue such as in the brain and spinal cord, also assisting the screening of foreign matter from the cells. Fish oils, evening primrose, flax seed or borage oil would be excellent choices. Vitamin E can assist too, but start at a low dose and creep it up gradually, to avoid any raising of blood pressure. Ask your doctor about taking vitamin E if you already have high blood pressure. Use as adjunct alongside the EFA’s. Vitamin C and bioflavonoids build collagen, the cement that binds cellular material together. This plays a role in mucosal barriers as well. Bioflavonoids also have some anti-viral activity. Dandelion leaf plus nettles will be gently diuretic and kidney-strengthening, while replacing some of the potassium excreted in the urine and building up the body’s mineral reserve. If kidneys are painful or sore, see your doctor. Use a chamomile compress on your back. For cysts, see your physician. Use a warm castor oil pack topically, but not for long-term repeated use. St Johnswort oil (different constituents than the tincture) is a superb topical nervous system anti-inflammatory. Coconut oil mixed with St Johnswort oil (apply topically) can be very soothing to inflamed, tingling or irritated nerves. Mix St Johnswort Oil with homeopathic Traumeel Oil for often very good results, apply topically as massage oil. Homeopathic Avena Sativa (wild oats) can be calming, and homeopathic Hypericum Perforatum (From St Johnswort) is specifically used for nerve injuries. Heavy metals will likely damage nerves: Make sure to safely and slowly detoxify metals for nerve health. Building liver health will be key too, Traditional Chinese Medicine has traced a connection between the nervous system and the liver. Eat oats daily, if you are not gluten intolerant: They can gradually and gently build up nerve health over time. Last but not least, let me hereby offer a few thoughts to stop chemtrail spraying in the first place. Class action lawsuits may be most effective, to hit the pocketbook is where it counts most. The pursuit of life, liberty and happiness is a basic Constitutional right (once upon a time, and we have to restore it). Those who approve such chemtrail spraying, must immediately be unseated from public office or their other positions of authority, and frankly be locked up. Expose their misdeeds with the power of the pen, and urge people to get involved in unseating this person abusing their position of power. Murdering one’s own people is treason. Also, let me be very bold and say truly and from the core of conviction, that by U.S. law, anybody who poses a physical threat to Self or Others, must be held against his/her own will in psychiatric hospitals. The hospitals cannot hold psychotic delusionals or anybody else against their will. But anybody who poses a threat of physical harm to anybody, must be held by law. I wouldn’t think they could lock You up as The Kook for saying such a thing, if you were in a class action group of people alleging such insanity among our high-ranking officials. But of course, you never know. (I am not an attorney, and do not know how binding this matter would be on a legal level). Let me also close on a note of hope. According to the reference book, “Alternative Medicine: The Definitive Guide”, “Metals that have no safe amount in the human system, may accumulate within the body (fat cells, central nervous system,bones, brain, glands, and hair) and may have negative health effects. Any level of these toxic metals is not normal. The levels usually need to rise above the established safety ranges to actually manifest in health problems. However, there is individual variation, and high normal levels may aggravate one person and not another”. So if you keep your immune system healthy and routinely detoxify in a safe and gentle way, you may have a much better chance of tolerating the toxic exposure. OPEN description box for appropriate links & credits. Here is undeniable PROOF POSITIVE that THE UNITED STATES MILITARY IS INTENTIONALLY POISONING INNOCENT AMERICANS. THE TRUTH IS OUT. USE IT WISELY. Heed the words spoken here & look at the Official Military Document. Chemtrails ARE the Delivery System for fungi, biologicals and much more. THIS IS TREASON & Crime against Humanity!! The Air Force is on record as saying they want to control the weather by 2025. The Massachusetts School of Law's Educational Forum presents part 2 of a Conference on Global Climate Change with Dr. Ilya Sandra Perlingieri, author, educator and environmental writer. The Massachusetts School of Law also presents information on important current affairs to the general public in television and radio broadcasts, an intellectual journal, conferences, author appearances, blogs and books. For more information visit mslaw.edu. Posted under Fair Use without intent to infringe upon copyright. THE ENVIRONMENT IS DYING. GEO-ENGINEERING IS KILLING EVERYTHING! I created this video using You Tube Editor per You Tube Guidelines. Original uploads credited in "Attributions". Thanks to all involved here, from the Radio Host to the Guest to JAHBOO7 & TrueRae & EVERYONE IN THE ANTI-CHEM TRAIL, ANTI - GEOENGINEERING/ CLIMATE CONTROL MOVEMENT! Together we face GENOCIDE at the hands of Psychopaths who seek to Control the Weather, FOOD, Water & the very Air we breathe! IF YOU WATCH ONE VIDEO TODAY MAKE IT THIS ONE. In Good Faith I hereby post this video under Creative Commons so that ALL MAY SPREAD THIS MOST IMPORTANT VIDEO FAR & WIDE. IT'S THAT IMPORTANT! Please listen very carefully to this video, although there is some conflicting evidence as to the increase in temperature, as CFACT reports that the Climate has not increased in temperature for well over 16 years, so this is my only confliction here, the rest is un-doubtingly evident in all of it's reports and finding's. We are experiencing our Sacred Ash tree's dying, so this new evidence supports it. People in many states around the USA are loosing plant life, trees, and we know the animals are affected also. Here is the CFACT Report. Together, we find ourselves in the fight of our Lives, for our lives, as you will see & come to understand here. Everything boils down to Greed & longing to Profit by CONTROLLING The Weather which entails H.A.A.R.P., Microwave Technology & spewing known toxins in our Atmosphere effecting ALL Life. Longing to CONTROL is an Age-Old Basis for Every War ever waged. This IS THE Most Serious issue we face today along with Fukushima Radiation, arguably caused by HAARP and countless transgressions against Nature. STOP THIS MADNESS NOW. No one has rights to that which was created to be SHARED! In Regards to the petition referred at the end, for now go to the Original upload til I edit it in. In the meantime GET INVOLVED & TELL EVERYONE YOU KNOW! THIS IS THE MOTHER OF ALL CRIMES.